Head the warning signs and stick to who you want to be, who you are and how you want others to perceive you. My parents always say, “You are who you keep around you”. So if anyone ever asks what a mother's day is like, please watch this video! It's a classic. Dionne Searcey of The Wall Street Journal reported in her article Bulky Yellow Phone Books Turn the Page to Online Video that yellow page companies across the country are offering video advertisement as editions to Web listings. My colleague, Kevin O’Keefe, commented that he believes this is a “gimmick meant to serve outmoded yellow pages business models” and that yellow page sales reps “don’t give a darn” how their customers’ ads look. 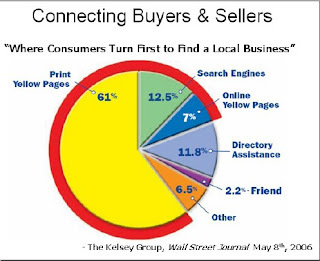 Studies indicate that consumers still turn to yellow pages ads first for their local buying needs. My husband was a sales rep with Yellow Book USA and although he’s since moved into a management role, I’ve witnessed the depth and breadth of his commitment along with that of the countless other sales reps I’ve worked with and become acquainted with over the years. It’s their job to care – if an ad doesn’t produce a solid ROI and the advertiser cancels, it’s money out of their pockets. I love the idea of Plaintiffs’ firms adding video ads to their yellow page listings online. For firms that already produce commercials, this is a no-brainer. The cost of the Internet ad is going to be exponentially less than reaching their target audiences on television. I’m not crazy about the idea of having any ads produced by directory-owned production. It’s not that the sales reps or their production assistants “don’t care.” Rather, I believe law firms would be better served by spending the money it takes to produce top-notch branded video ads that fit within their brand strategy, are targeted to the most important audiences, set them apart from their competition, and comply with the rules of ethics that are mandatory for all law firms in the U.S.
Bottom line: these ads are valuable tools to increase a firms business if done right. Length of article: The minimum and maximum word count. An optimum number of words per article might also be listed. It is important to comply with the editorial guidelines of your target publication in order to maximize your chances of publication. And if you’re not sure about something, contact the editor and ask. It’s a great way to open the door to conversation and to offer yourself as available for commentary on similar issues while getting the editorial information you need to submit your article. You should also remember not to boast or overtly promote your firm or your services. Such behavior is extremely frowned upon. I have quickly realized that the angst of forging a balancing act between work and personal life is not just something I share with my fellow newbies to the workforce; instead it is bond that binds all ages of women and men in the workforce. My boss encouraged me to read a book called, “Secrets of Super-Productivity: How to Achieve Amazing Things in Your Work Life,” by Neen James. The book is truly a breath of fresh air. I encourage anyone, of all ages and genders, to pick up this uplifting and informative book that will give you valuable insight into managing yourself, work, career and position. We remember . . . all those who lost their lives and loved ones in the attack of September 11, 2007 and especially Noell Maertz and his family . . . . and the soldiers who have lost their lives fighting this war on terrorism. I received an email today from my brother-in-law, Brad Blumberg, who owns and operates http://www.smarteragent.com/. He said that they're starting a Mobile Monday in the Philly region. It’s a global grass roots organization for people involved with mobile technologies. He blogged why he thinks we need one in Philly at http://www.momo-ma.com/. You can read about the organization, which started in Helsinki, in the “About” section of the site. Their inaugural event is Monday, September 24 at the Union League in Philadelphia. Here is an interesting social media/networking sight I found while researching blog topics. The name of the site is Sk*rt. It is a social media ranking platform, geared towards women, that enables you to find cool things, smart scoops, clever ideas, excellent products and exceptional information. The content of the site's information range from Arts & Entertainment, World News & Business, Family & Parenting to Internet & Technology. For more information check out the Sk*rt website at http://www.sk-rt.com/ or search the FAQ's about Sk*rt at http://www.sk-rt.com/faq-en.php.